With Labor day this weekend, school starting, weeds tackled, and planting mostly done for the year, September heralds the beginning of the end of summer. We are squeezing in one more trip to the beach this weekend (surfing included) and one more summer party to attend next weekend, but mostly we are in transition both on the farm and in the home. The kids and I will have a new schedule, one much less involved with the remaining 6 Thursday farmer’s markets as well as the harvests. The new little one can be expected anytime really, but most likely in 2-3 weeks. We have made arrangements for help to get our CSA shares harvested in the midst of new baby and to make it to every market of the season, so hopefully there will not be any glitches in that plan. Things are feeling settled for the year. We had the opportunity to plant fall and winter crops with a friend over at his growing space (Dicky Farms West). This gives us a nice bit of extra dry land to have veggies in for the coming seasons. 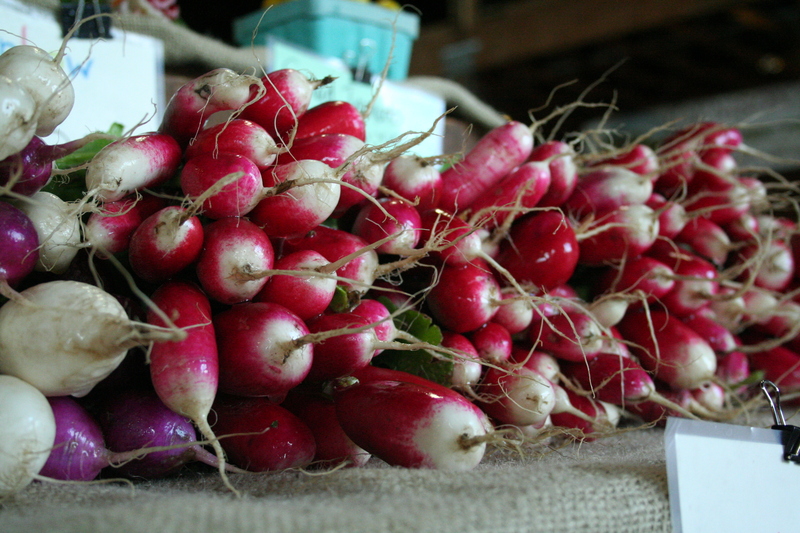 This week we harvested the first of the crops ready there, the lovely French Breakfast radishes we had at market and in the CSA shares this week. Radishes! The beginning of fall food, although not the end of summer’s. Really, even though these small changes are signaling the change of seasons to come, September’s vegetables harvests are still full of all the summer goodies. With the crazy spring weather slowing everything down this year, we are just now getting in to some of our favorite summer crops like tomatoes and peppers. There is still so much to be harvested! September and October are the fullest, ripest months on the farm…duly referred to as harvest time! It is indeed a time of abundance. I can’t help but love the feeling this year of my belly ripening, fully round now and as sweet as can be. As we work our way towards fall and Thanksgiving time, these next few months will give us much to be thankful for. Enjoy every last moment of summer weather, each bite of deliciousness the season has produced for us, and your own season of fullness as we all get ready to settle in to autumn.